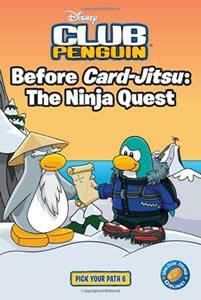 As you may know, Club Penguin released a brand new book a while ago, and today we are here to bring you Before Card-Jitsu: The Ninja Quest Book Codes! If you are unsure how to unlock and use these codes, please see our Club Penguin Book Codes page. Basically, when Club Penguin gives you a question, look it up and see if it’s in our list below. If not, press the small X (within the play screen), and ask for a new question. Within a few tries, you’ll have a question in our list. In that case, look at the answer we provide, and enter it. From there, you’ll receive a blue book and 1500 coins, or 2000 coins! How did these work for you? How long did it take for you to unlock the items and/or coins? Leave a comment and tell me! I unlocked these a while ago; when you first released the codes. Thanks! Nvm i found out the prob! this has wrong codes for me! !